New release is loaded with powerful features and adds a flexible subscription option with the introduction of PowerDirector 365, a version that ensures users get unlimited premium add-ons, and the latest features and supported formats. TAIPEI, Taiwan--(BUSINESS WIRE)--CyberLink Corp. (5203.TW), the world's leading consumer multimedia software company, today released the latest version of its leading video editing software, PowerDirector 17. It comes in 3 versions, Ultra, Ultimate and the new PowerDirector 365 subscription option. Along with significant updates to PowerDirector's creative design tools, PowerDirector 365 adds unlimited access to a vast collection of premium add-ons, bundled with the flexibility of subscription pricing. While it continues to exceed the needs and expectations of casual users, this new release introduces a number of professional-level features that will satisfy the most advanced video creators. "Professional video editors require complete creative control and flexibility when working on projects, whether they be personal or for clients," said Dr. Jau Huang, CEO of CyberLink. "To help them achieve this standard, we've made significant improvements across the board to PowerDirector's design tools, editing and rendering engines and add-ons, all of which combine to deliver the perfect video editing solution for the modern creative professional. The addition of subscription with PowerDirector 365 ensures users will always get the latest tools as soon as they become available, giving an edge to their creativity." 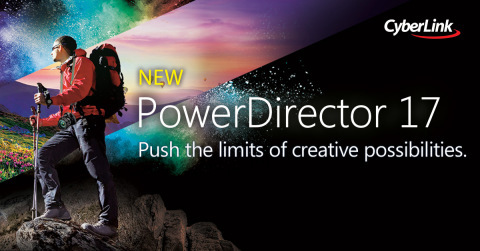 PowerDirector 365 is the center piece of CyberLink’s new Professional Series of creative tools. It is the ideal solution for advanced video creators who want to always have access to the latest and most advanced tools. It builds on the high-performing, feature-rich and easy-to-use core features included in all versions of PowerDirector. On top of this foundation, it brings a large and growing collection of professional effects, templates and add-ons, including all the AI Style Packs exclusive to CyberLink and 50GB of cloud storage. Most important, it offers affordable subscription options to ensure users continuously get all the newest tools through frequent updates. PowerDirector 17 Ultra remains the benchmark that combines rich features, ease of use and performance and provides the base functionality to all versions. Simplified editing tools allow for rapid movie creation and eliminate the steep learning curve usually associated to video editing. The software continues to offer unrivaled rendering and production speed and the most comprehensive set of support formats and codecs. The improved Video Collage Designer can combine up to seven videos simultaneously, with animated openings and endings. Express Projects, one-click color correction tools, and the easy-to-use Action Camera Center make editing any video project a breeze. For video editors who want to push boundaries, PowerDirector continues to innovate with refinements to its pioneering 360˚ stabilization technology and editing tools. Workflow management is enhanced with new features like Nested Projects for timeline editing and Video Pre-cut help to streamline the creative process. Professional editors can now take greater control of the creative process with frame-by-frame motion tracking, multi-key sampling for chroma key editing and a host of other tweaks to PowerDirector's design tools. PowerDirector 17 Ultimate offers the perfect balance of core functionality and professional-level add-ons, at one value price. On top of all the features of the Ultra version, it comes with an impressive selection of add-ons exclusive to CyberLink, in addition to professional tools from NewBlueFX, proDAD, and BorisFX. Includes PowerDirector 17, unlimited access to CyberLink premium add-ons and content packs include AI Style Packs and 50GB CyberLink Cloud storage.